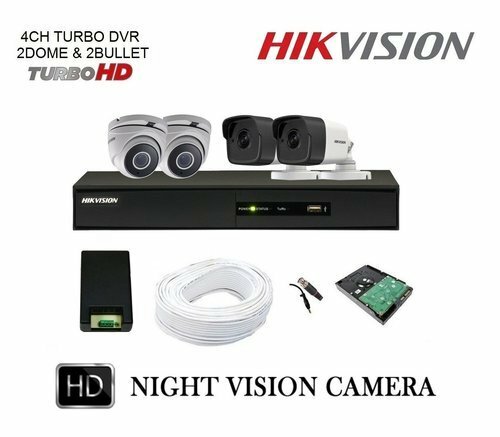 Hikvision 4CH Turbo HD DVR with 3MP 2 Dome & 2 Bullet Camera Full Combo Kit. Hikvision DS-7B04HUHI-K1 5MP 4CH Turbo HD DVR 1Pcs. Hikvision DS-2CE56F1T-ITM 3MP Night Vision Dome Cameras 2Pcs, Hikvision DS-2CE1AF1T-IT 3MP Night Vision Bullet Camera 2Pcs. 1TB Seagate Surveillance HDD, 90Mtr Copper Cable 1Bundle, 4CH Power Supply, BNC 8Pcs, DC 4Pcs. Installation is not included.